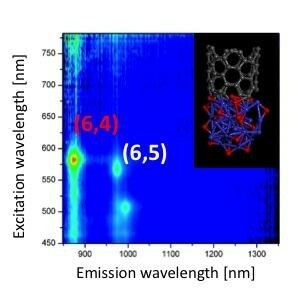 A team of Researchers at Tohoku University have come up with a novel strategy for manipulating chirality of single-walled carbon nanotubes (SWNTs). By applying this method, preferential synthesis of (6,4) SWNTs has been achieved for the first time. The unique growth mechanism has been explained through comparing experiments and theoretical calculations done with a esearcher from the University of Tokyo. Chirality-selective synthesis of SWNTs has been a research endeavor for the last twenty years and is still challenging because of the difficulty in manipulating the atomic structure in the one-dimensional material. Guided by Associate Professor T. Kato, the research team showed predominant synthesis of (6,4) SWNTs by tweaking the oxidation degree of the Co catalyst. The comprehensive mechanism is examined through a systematic experimental study coupled with first-principle calculations, exposing that the independent control of tube diameter and chiral angle accomplished by altering the binding energy between SWNTs (cap and tube edge) and catalyst causes a radical transition of chirality of SWNTs from (6,5) to (6,4). Since our approach of independently controlling the diameter and chiral angle can be applied to other chirality species, our results can be useful in achieving the on-demand synthesis of specific-chirality SWNTs. This is necessary for the practical use of SWNTs-based future devices such as ultra-high performance transistors, electrical and optical memories, and various sensor applications. Kato added, "High purity synthesis of (6,4) SWNTs can contribute to pushing the study of SWNTs to industrial - especially optoelectrical - applications due to the largest band gap and highest quantum yields of (6,4) SWNTs." The study findings have been published online on September 11th in Scientific Reports.